You know Ring-Around-the-Rosie. Almost for sure you played it as a kid, and you’ve probably played it with kids since then. It’s such a commonplace, obvious kids’ game that it’s easy to dismiss it as unimportant. But when the kids asked me to play it with them today, and ten or so children got involved, I was super excited. For 2–4-year-olds, Ring-Around-the-Rosie is kind of the perfect developmental experience. Let’s look at what’s going on for kids in this classic game. 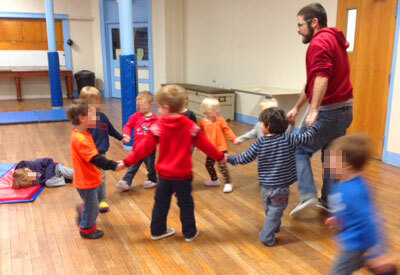 PHYSICAL DEVELOPMENT: There’s an awful lot of gross-motor coordination in Ring-Around-the-Rosie. To play the game, you’ve got to walk sideways, in a circle, while holding hands and singing. That sounds pretty easy to adults, but only because we practiced it for years. Even for four-year-olds, this can be a pretty complicated process, taking a lot of concentration. COGNITIVE and EMOTIONAL DEVELOPMENT: There’s a lot of patience and timing involved in Ring-Around-the-Rosie. You can’t just fall down any old time—you’ve got to wait for exactly the right moment. It’s hard to delay gratification like that, when falling down is the fun part! Children build self-control playing this game. SOCIAL DEVELOPMENT: This is the big one. Most young children are working hard, all the time, on coordinating their social interactions. Listening to other people and meeting their needs while simultaneously getting your own needs met? That’s like rocket science, as far as most 3-year-olds are concerned. But Ring-Around-the-Rosie provides the perfect opportunity to practice. There are clear rules, which help everyone sort out what they’re supposed to be doing (hard enough for a lot of young children), but within that you have to make a lot of choices. Where do you want to stand? What do you do if they won’t let you in? What do you do when someone wants to get in between you and the person you wanted to stand with? What do you do if the group starts without you? Oh, yeah, and how do we all figure out how to walk the same direction and not crash into each other or mush up the circle? It’s a complicated business, but fortunately the game gives the opportunity to practice over and over again. THE IMPORTANCE OF PLAY: We’ve said it before and we’ll say it again: play is the absolute best vehicle for learning. We could sit down and do “lessons” on all these physical, cognitive, and socio-emotional skills til the cows come home, and it wouldn’t mean as much to the kids, or be as effective at teaching, as a few minutes of playing this game. The game is FUN, which means kids are motivated to keep trying even if they’re frustrated, and are powerfully reinforced. when they get it right. The game does all the teaching, naturally, without a lot of effort or stress. So yeah, it was awesome to see the kids get into Ring-Around-the-Rosie. The classic games are classic for a reason. Yes!!! I could not agree more! Thanks for the great article. Wow. I usually play this game as a fun way for me and the children to bond. I did not realize there was so much more. Thank you for sharing.